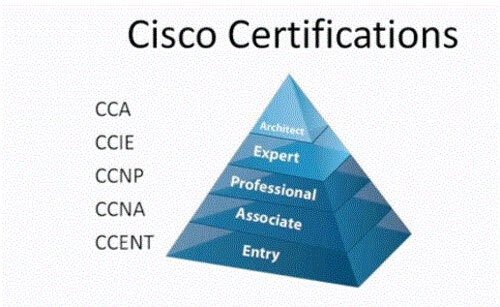 Cisco certifications can be grouped into 5 Levels such as Entry Level, Associate Level, Professional Level, Expert Level and Architect Level. These are available in 7 categories are Routing & Switching, Design, Network Security, Wireless, Voice, Storage Networking and Service Provider. Cisco Certifications include CCNA, CCNP, CCT, CCIE, CCENT, VOIP training and more. Follow the complete article and know Cisco Certification Details like Course List, Jobs, Salaries, Training, Exams & Costs, etc. Cisco Certifications Courses are important and validate candidate knowledge related to Cisco Products and Services. Cisco Offers Two Types of Certifications Exams they are Proctored exams delivered at a test centre and Self-administered online Exams. After a candidate passes all exams required for a certification and signs the required agreements, Cisco will send a Cisco Certifications certificate identifying the candidate’s Cisco Certification ID and valid certification dates. Cisco offers various levels of certifications like Entry Level Certifications, Associate Level Certifications, Professional Level Certification, Expert Level Certifications and Specialist Certifications. The main requirement for obtaining Cisco Career Certifications such as CCENT, CCNA Routing and Switching, CCDP and CCIE and Cisco Specialist Certifications. CISCO Certification Cost may vary by level and by currency and by Country. Cities like New Delhi, Delhi (including Gurgaon, Noida and Delhi),Bangalore Karnataka, Mumbai Maharashtra, Pune Maharashtra, Chennai, Tamil Nadu offer the highest salaries to Cisco Certified Engineers in India.